A simple pastor before his appointment to lead Malta's 340,000 Catholics, Archbishop Paul Cremona recently marked his first anniversary in the post. According to the island's paper of record, the Dominican prelate's year at the helm hasn't seen its greatest impact as "administrative or managerial," but that of "an itinerant preacher." Archbishop Paul Cremona's first year as head of the archdiocese was recently the subject of an article in a UK Catholic paper. In a half-page article in The Catholic Times dominated by a picture of the archbishop, the writer gave readers an overview of the archibishop's first year in office, emphasising his almost uncontrollable urge to meet the people, whether in churches, clubs, homes, schools or wherever they happen to be. Quoting from an interview featured in The Sunday Times, the article quoted the archbishop saying that "his presence was imperative to show that the Lord is with them". The article remarked about Mgr Cremona's ability to communicate with the faithful in simple language and terms. The author quoted "a professional lady in her 40s" telling him that after hearing the archbishop preach during a confirmation ceremony in her parish she "really understood who the Holy Spirit is. The Archbishop did not waffle. He just spoke to us in simple Maltese". It is well known that Mgr Cremona is a great admirer and devotee of Blessed Pope John, who in spite of being 73 when he was elected Pope in 1958, rarely appeared with a stern smile on his face. 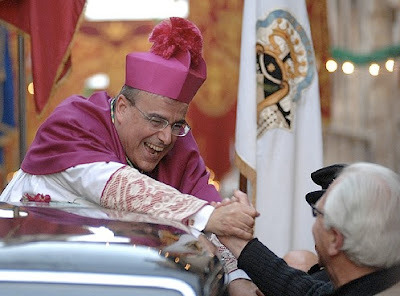 His smile, like Mgr Cremona's, was one of his features. Then again, it's not a Franciscan year on deck... but a Pauline One. More "Papergate": The Cardinal as "Magnet"
"Our Only Security is Hope"